Diet Plans for Elderly in Delhi, Diet Chart for Elderly in Delhi, Elderly Diet Counseling in Delhi, Dietitian for Elderly in Delhi. Elderly nutrition is obviously an important part of a senior's overall health and well-being. Unfortunately, proper elderly nutrition in Long Beach is often overlooked when you consider all of the issues seniors face on a daily basis. Regular activities become more difficult, the medication must be taken at specific times, and the home must be made safe. But what about elderly nutrition? Just like the rest of us, seniors need to eat right to stay healthy. Like anything else, a healthy diet can become more difficult as we age. Follow these 8 elderly nutrition tips for Long Beach seniors to ensure your loved ones maintain a healthy diet. 1. 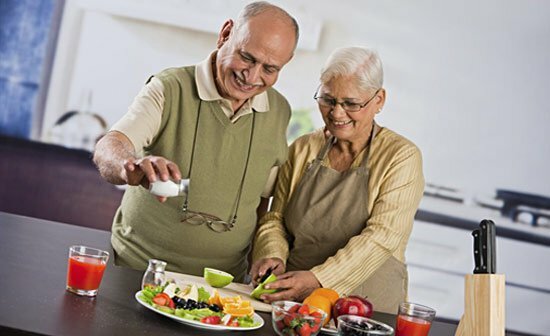 Eat meals with high nutritional values:- Elderly nutrition begins with eating the right amount of vitamins and minerals. Since many seniors experience a decrease in appetite as they age, it's important for their smaller meals to be high in nutrients and calories. The best food for elderly nutrition includes fresh vegetables and fruit, whole grains, and meat and dairy products that are high in protein. 2. Fat:- The diet of older people should be low in fat, not fat-free. You can limit your fat intake by including lean meat and low-fat dairy products. As far as possible, do not fry your food in oil. 3. Add additional flavors:- If your loved one's sense of taste is also on the decline, adding dressings, sauces, spices, and herbs to their food can provide that much-needed boost to their appetite. Another way to stimulate the appetite and ensure proper elderly nutrition is to have a variety of a small amount of food at each meal. 4. Protein:- Protein is essential for the elderly. They need it to maintain a healthy immune system and to prevent muscles from wasting away. At the same time, they do not need that much of energy. Foods such as eggs, chicken, meat, and fish, which are low-fat sources of proteins, are very much essential for the elderly. 5. Carbohydrates and Fiber:- The entire body obtains its energy from carbohydrates. Bread, pasta, cereals, and other grains are rich in carbohydrates. You can prevent constipation by taking a diet that is rich in water and fiber. 6. Watch for dental issues:-It's difficult to expect the elderly to focus on nutrition if they're having problems chewing food. Ask if they have any pain when eating, and have them visit the dentist regularly to make sure their dentures fit right and they don't have any cavities. 7. Check food storage:-Seniors who live alone should keep plenty of non-perishable foods in the home. Unless they have a home care services company managing their care, health problems or bad weather can make it difficult to go to the grocery store. 8. Vitamin B12:-Vitamin B12 is usually absorbed by an intrinsic factor in the stomach. Many of the elderly suffer from Vitamin B12 deficiency because they suffer from atrophic gastritis, a medical condition characterized by inflammation of the walls of the stomach, growth of bacteria, and lack of the intrinsic factor that is responsible for the absorption of this vitamin into the system. The elderly need each of the above nutritive elements to keep themselves in a healthy condition. The elderly should be as active as possible and take a well-balanced diet. * Eat breakfast foods for lunch or lunch foods for dinner. * Use color as a guide for variety in a meal. A good meal should provide three distinct colors on the plate. * Increase the variety of texture in meals. Add whole grain bread/ Roti (rye or wheat), whole grain cereals, and cooked legumes (beans of all types, lentils, dried peas). * To reduce calories select nutrient-dense foods. Enjoy smaller portions of foods high in fat, sugar, and sodium.